This GPS/GPRS/GSM shield uses an embedded SIM548C chip from SIMCom.Featuring an industry-standard interface and GPS function, the combination of both technologies allows goods, vehicles and people to be tracked seamlessly at any location and anytime with signal coverage. Switch S1: PC upload program to Arduino board/PC communicates with GPS/GPRS/GSM Module( Arduino programming/module communication). Switch S2: GPS/GPRS/GSM Module directly connects with PC through USB port or module communicates with Arduino board, which communicates with PC(USB/Arduino serial communication). Switch S3: GPS power supply to be on/off(GPS power switch). it is recommended you to supply 7~12v power via the power jack. When using the GSM mode, the module requires an external power. But the power consumption is not high,just 200mA@7v, when calling. Module driver pin jumpers: Applying the Module Pin Jumpers(J10-J12) will allocate Pin 3,4,5 for driving the module. Removing the jumpers will release the above Pins, and you could connect the driver pins to the other digital pins on your board to avoid the pin conflict. //you can remove the J10~J12 jumpers to reconnect other driver pins for the module! 1.If your module works, the indicator LEDs beside the switch S2 will light up, this means that the module is running correctly. The LED marked "NET" is used to drive a network status indication LED. The working state of this LED is listed below. 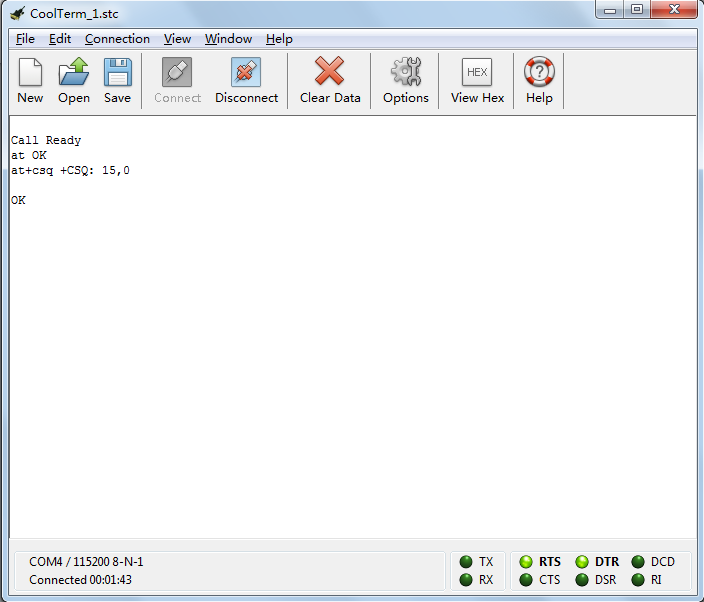 2.Send the AT commands to the module by using Coolterm(or use the Arduino serial monitor). Note: If you want to program the Arduino, please disconnect the coolterm to release the communication port. Signal strength test with on-chip antenna: Sending AT command for signal quantity report AT+CSQ through serial port terminal application, will receive signal strength as below. The later value “0” means channel bit error rate. The mobile equipment returns the list of parameters and value ranges set with the corresponding Write command or by internal processes. This command sets the user-definable parameter values. AT : Test the serial communication.if it works,get "ok" as the picture show. After you input the sms, press 'ctrl-z'[HEX:0x1A]to send the message. Press 'ESC' to quit without sending. For more detail AT commands, please check the document here! 1.After turn switch s3 on (the right side), the GPSPWR led will be lit. 2.In this mode, switch s2 is on left side. The GPS module communicates directly with PC. 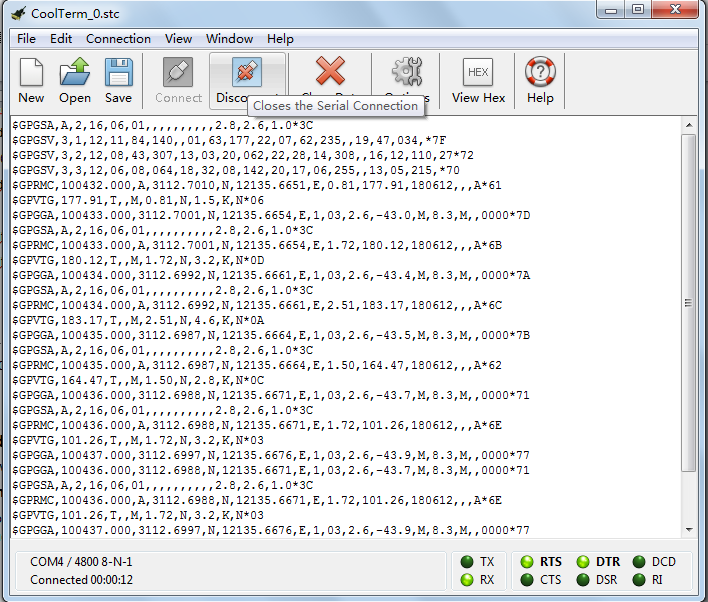 The serial port terminal application will show the data sent out by GPS module. The Sketch for GPS USB mode: Following the steps included in sketch below first! // #        For more detail information, please check the product wiki page.~. After turn switch s3 on (the right side), the GPSPWR led will be lit. In this mode, switch s2 is on right side. The GPS module communicates with Arduino board, and Arduino board communicates with PC. The serial port terminal application will show preliminary processed data from Arduino board, which gets the data from GPS module. **The Sketch for GPS mode via Arduino board: **Following the steps included in sketch below first! After the network indication LED showing GSM module has found the network, we can use it to send out message. Setp 1: Set the system to text mode(as opposed to PDU mode) with command AT+CMGF=1(type "AT+CMGF=1" in the input line, then press KEY), you will get response as below. Step 3: Type in you message content, end with pressing key. Step 4: Send Ctrl character Ctrl+Z to verify your message sending (just pressing Ctrl and Z simultaneously, key is not need after that).If it send out successfully, it will show as below. A set Coolterm in options-receive-ignore receiving signal err to ignore connection err and it will reconnect automatically. Q Serial port terminal application warns “Normal power down” when reconnect after disconnect, and Network indication LEDs both turn off. A Choose disconnect, and connect again. Arduino board will reset at every connection to PC. During resetting, the Arduino board will emit a low pulse to pin PWRKEY of GPS module. So if GPS module is already on before connection, the low pulse will switch it off, if not, the pulse will switched it on. Q Serial port terminal application send out all the strings on the screen after pressing Ctrl+Z, when trying to send message in GSM USB mode. A It is possible to send Ctrl characters when the terminal is set to Line Mode. We can choose the Line Mode in options-terminal-terminal mode, or we can send the Ctrl character though sending string box of Coolterm in hexadecimal format. Please refer to Ways to send Ctrl +Z in Coolterm. A Restart the serial port terminal application always works for other troubles. 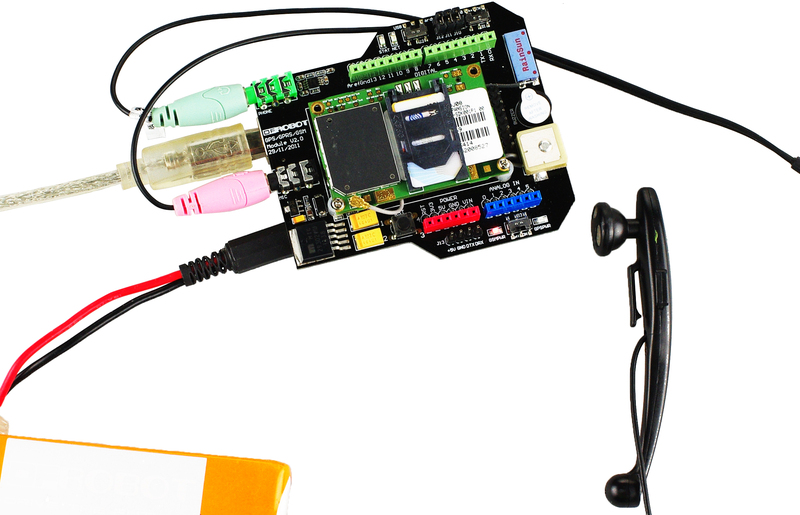 Arduino GSM library is a very complete GSM library for Arduino. Get PS/GPRS/GSM Module V2.0 (SKU:TEL0051)from DFRobot Store or DFRobot Distributor.